Imaginary glimpse of underwater life. 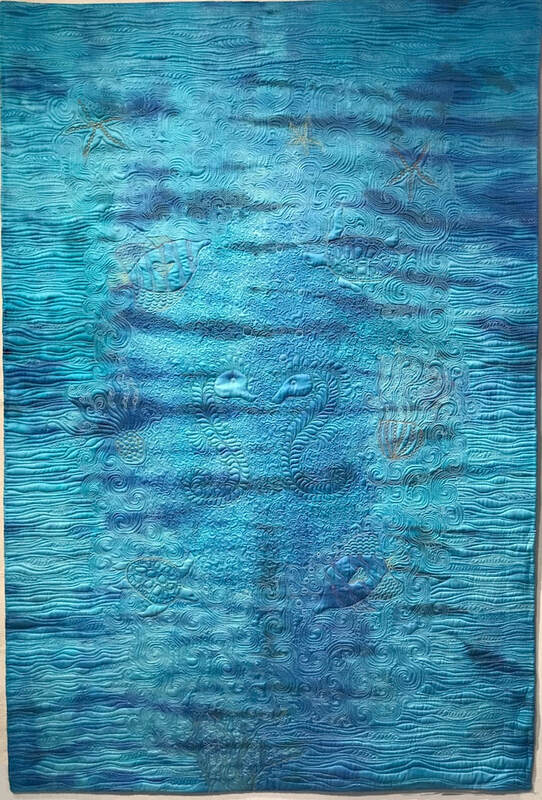 This quilt was intended to be displayed on a child’s cot in the horizontal plain and hence the orientation of many of these underwater creatures is facing outwards to the edge. My inspiration was a visit to the Oceanografic, an oceanarium situated in Valencia, Spain where the different marine habitats of the world are represented. I saw so many creatures with shapes, colours and movements which invaded my imagination. Whilst the true ‘under the surface’ world is extremely dark many of the aquariums were bathed in vivid blue light to enable the entranced visitors to see and enjoy the underwater creatures. It became my seascape to explore in stitch.